RadDockZone controls can lay out their children horizontally (by rows) or vertically (in a single column).You can set the orientation using the Orientation property. By default the value of the Orientation property is "Vertical". The Orientation property interacts with the Height property and the FitDocks property, as shown below. 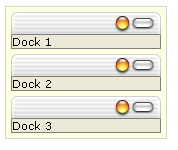 When the value of the Orientation property is "Vertical" (the default), RadDock controls are docked in a single column. If the docked controls are wider than the RadDockZone, the docking zone expands to accommodate the docked controls. When the value of the Orientation property is "Horizontal", RadDock controls are docked in rows. The RadDock controls are ordered horizontally until they reach the RadDockZone width, after which they are ordered horizontally on the next row. The FitDocks property has no effect if the RadDockZone has a horizontal orientation.